Enhance your home with Westin's soothing signature scent of white tea. Now at The Westin Chosun Seoul, you can buy and enjoy the latest additions to the Westin retail collection in your very own home! Custom-designed to represent the Westin brand, the white tea scent is the result of extensive research and carefully selected ingredients. It combines the lovely fragrances of geranium and freesia to relax, invigorate and refresh the mind, body and spirit. Westin brand's "This is How it Should Feel' print ad campaign featuring a White Tea fragrance strip was the first of its kind executed by a hotel company. After its successful debut, the white tea scent is now being used world-wide as part of the Westin Welcome Program to help guests unwind and melt away all the fatigues of long travel. Westin's fantastic white tea products include 100% all natural soy candles, which are all individually hand poured. They are clean burning and can amazingly last for up to 60 hours. White tea diffusers have natural reeds that absorb the white tea scented oil and diffuse it throughout the room, evaporating into the air and leaving only the lingering refreshing scent. 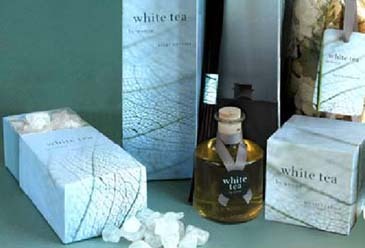 The white tea retail products are displayed at Jane Packer and the 9th floor Executive Lounge and can be purchased at vecchia e nuovo deli. Light up a candle or set up a diffuser at home when the mood strikes and instantly feel your spirits elevate and your surroundings transform into the luxurious ambience of a Westin hotel.